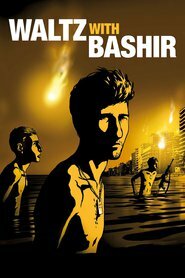 Here you will find Vals Im Bashir 2008 film trailer, pictures and plot. IMDB rating and user reviews will help you to understand if you should watch this animated movie in theater or buy on DVD. Also don't forget to check the similar cartoons! Description: Much awarded animated documentary, in which director and Israeli army veteran Ari Folman interviews friends and former soldiers about their memories of the 1982 Lebanon war and especially the Sabra and Shatila massacre in Beirut. The usage on animation enabled Folman to illustrate their personal memories and dreams. Is Ari Folman your favorite director? And do you like biography,military,documentary,drama,cartoon genres? Then you certainly need to buy Vals Im Bashir on DVD or watch the animation film in theater.